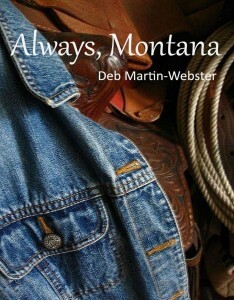 This month, Shorehouse books released Always, Montana by Deb Martin-Webster. This new novel is the sequel to Deb’s Love, Montana. Tell us a bit about the newest installment to the Love, Montana series? The sequel entitled, Always, Montana continues the love story of Rose Montana. After the untimely death of the love of her life husband, Lash who also goes by the pen name of “Montana Joe” Rose must decide whether to stay in Montana and keep her husband’s legacy alive or let it die with him. Being a fiercely determined woman, Rose decides to stay and raise their daughter in Montana. She’s supported by her family, friends and her love for the Big Sky country. Was it more difficult to write for the characters or less difficult this time around? Oh, it was much easier writing for the characters in book two. Their personalities are well developed and to be honest they’re quite vocal. I find myself talking about them as if they are real people. Each day, I have to remind myself that they are just characters and their voices are my own thought, humor, etc. Some characters are more vocal than others. I truly enjoy writing for Raymond Winterbee, who is full-blooded Blackfoot. His spunky wisdom and sharp sense of humor makes me laugh. See, there I go again talking as if he’s real. But in my mind, they are all real to some extent. They come to life in my novels and they are the ones who are telling the story, and I feel as though I’m just along for the ride. What were your inspirations for your new characters? As a retired university administrator or as I like to call myself, a PIP (Previously Important Person) I’ve dealt with vice presidents, deans, professors – you know, the high-level, self important types who think nothing can run smoothly unless they oversee it. The new characters Meryl Montford-Wellesley, her husband Monroe and their son, Jameson are the CEO’s of a Fortune 500-type Company called, The Montford-Wellesley Corporation. They are quite different from the Montana or so the Montana’s think. Meryl was born and raised near the Montana’s ranch in the small town of Dodson. She is a strong woman and the back-bone of the business as is Rose who now oversees the Montana Empire. They have a lot in common. Jameson, on the other hand, is another story. He’s not interested in running anything except his mouth and a bar tab. In case anyone didn’t read Love, Montana (and we recommend they do before they read this book) do you have favorite characters in each book and if so, why? As I stated earlier Raymond is one of my favorite because of his spiritual wisdom mixed with his Blackfoot sense of humor. However, I do enjoy write for Jannine and Keough. They are completely different culturally, but very similar in demeanor. Both are my alter-egos so it’s very easy to like them. Some of the lines that come out of their mouth actually make me laugh out loud. Both are tough as nails on the outside but total cream puffs on the inside. I also love writing for little Charlotte, who is now in her terrible-twos; she is stubborn and very opinionated, reminding me of me when I was two. How hard is it to let the characters go after you finish a book? It’s really difficult to say adios to them when the last chapter is complete. What I have to do is tell myself is that they have gone back to their everyday lives and when I need them to come back they do. A series writer friend of mine once told me, “They used to call us fiction writers loonies, because we’d hear so many voices in our heads. We can’t separate fiction from reality and never know whether we’re living in our novels or our novels are living in us.” I must admit I do miss my characters when the novels are finished. I guess that’s why I enjoy being a series writer. I get to hang out and socialize with them whenever I write a new book. I guess you could say they’re like a built-in friend network, like a surreal Facebook. What else can we expect now that Love, Montana and Always, Montana are published? Hah, I expect to sell a lot of books and take a much needed vacation. I have this fantasy of buying a pontoon boat and hanging out for a few weeks at one of our local lakes. After that I’ll most likely start working on book three, Forever, Montana. Of course I’ll continue writing for HumorOutcasts.com. Maintaining a sense of humor is important for writers, especially when you receive a not-so-good book review. All-in-all I love writing and will continue to write as long as folks enjoy my work. What a nice interview. I’m going to have to check out Book 1, because Book 2 sounds great. Good luck! Thank you CF for your support and best wishes! !